Brittany grew up in the small town of Carnation, Washington and was hooked on horses before she could walk. To follow her passion, she began showing Arabian horses competitively at 9 years old. Brittany then moved to Arizona to attend a specialized equestrian high school, Arizona Agribusiness and Equine Center, to pursue equine science and show Arabian horses on a national level. After graduating high school with a Certificate in Equine Studies and an Associate’s Degree in Science, Brittany attended Arizona State University and graduated in 2012 with a Bachelor’s Degree in Exercise and Wellness for Athletic Training. Upon graduation, Brittany returned back to Washington and currently owns three horses. 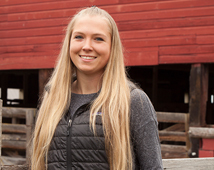 She feels that Evergreen Equine has helped her become much more knowledgeable in equine medicine and has pushed her to want to continue pursuing a career in the equine veterinary industry.